KSiteTV's Craig Byrne and Shilo Adams break down the 2017 ABC fall schedule, including most promising trailer and likely first cancellation. SHILO: I think I like this move more than you do. While Deception would’ve filled the Castle hole that’s still gaping on ABC’s schedule, I’m assuming they’re going to use its family friendliness after American Idol on Sundays this spring, so with it out of the running, The Good Doctor is their next best option. 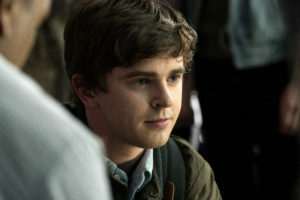 Medical dramas tend to skew older, which will work well with the Dancing audience makeup, and The Good Doctor has generated pretty significant social buzz thanks to its lead character, playing by Freddie Highmore (who has a sizable international profile), having autism. Granted, the show airing at 10:00 should keep its ratings ceiling a little lower than it would’ve been had it aired at 9:00, but it’s in a pretty ideal situation and should become ABC’s top fall drama without much competition. CRAIG: And see, while I don’t question the artistic merit of a show like this, I feel like we’ve already seen Freddie Highmore playing the “socially awkward character that everyone thinks is weird,” and recently, at that. If audiences are put off by the lead character — the show won’t have legs. Fortunately, Highmore is charismatic and can hopefully present his character to be charismatic, but I still think something lighter and fluffier needs to come out of Dancing. Still waiting for their next Castle.